How Many Pounds Do I Need to Lose to Go Down One Pant Size? Andrea Cespedes has been in the fitness industry for more than 20 years. A personal trainer, run coach, group fitness instructor and master yoga teacher, she also holds certifications in holistic and fitness nutrition. Earn the bragging rights to having dropped a pant size through dedication to diet and exercise. Exactly how much weight you'll need to lose to achieve this weight-loss milestone varies, though. No standard for sizes exists among clothing manufacturers; one brand's size 8 is another brand's size 6. The differences between pant sizes also vary according to a garment's particular style and cut. Your body's shape and the way it changes as you lose weight also plays a role in how soon you'll drop a size. American sizes for women were originally based on a patternmaker's tool called the L-square. When this proved too confusing for customers, the National Standards Bureau established a consistent sizing system based on a 1939 study of the measurements of over 15,000 women. As the population gained weight, this standard fell to the wayside, with clothing makers abandoning it completely in the 1980s. Manufacturers now develop their own sizes based on sales and perception of "their" consumer. This means that it's impossible to truly determine how many pounds you need to lose to drop a pant size. It varies from manufacturer to manufacturer. You could purchase a size 10 in one store and fit into a size 8 in another. You didn't lose weight as you strode down the hall of the mall, you just entered a store with different sizing standards. Size 10, for example, has a 30-pound spread among manufacturers, according to patternmaker and author Kathleen Fasanella. Because it's based on waist circumference, men's sizing is a bit more standard. The numerical size of the pants roughly represents the number of inches around the midsection. But, how a man wears his pants also defines his size. Many men sling their pants around their hips and are unlikely to drop a pant size as quickly as man who wears his pants around the widest part of his midsection, where he's likely to lose fat more quickly. The body shape you're born with determines the way in which you lose weight, and that affects how your clothing fits. The first place you gain weight is often the last place you lose it. In men, the abdominal region may resist weight loss, meaning that it takes a fair amount of weight loss to drop a pant size. In women, the hips and thighs may be a trouble region and hard to lose even as pounds come off. Changes in your body proportions as you lose weight might also affect your pant size. For example, your waist might correspond to a 6, while your hips are more in line with an 8. If you lose fat from your waist before your hips and thighs, you might not drop a full pant size, even if you've slimmed down and lost weight. When you lose a large amount of weight, you may have excess skin that prevents you from dropping a pant size. Women who've experienced multiple pregnancies, for example, might have such lingering loose skin, despite losing weight. And, depending on your genetics, as well as your rate and amount of weight loss, loose skin resulting from significant weight loss might keep you in a slightly larger pant size. But remember, your health and attractiveness aren't determined by the number on your clothing label, but rather by whether you're enjoying a healthy, active lifestyle. So while dropping a pant size can definitely keep you motivated, let your real focus be on creating health-centric goals for your fitness journey. 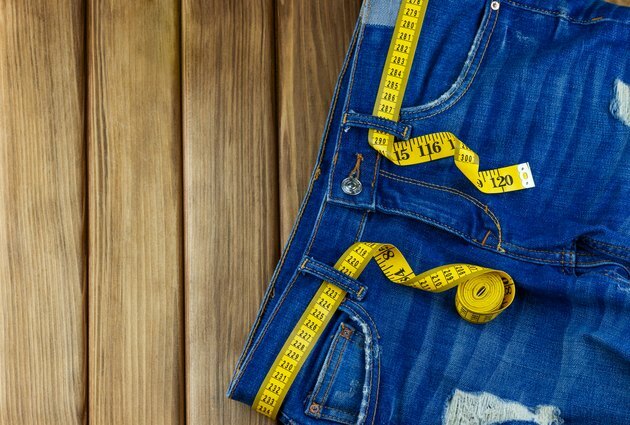 Fashion Incubator: What are the Measurements of a Size 10? The New Yorker: Who’s Buying J. Crew’s New XXXS Clothes? How Much Weight Do You Have to Lose to Go Down Three Dress Sizes? Can You Keep Fullness in Your Face When Losing Weight?